Sean is back in his beloved Italy once again with his girlfriend Louisa. He's living in a town not terribly far from Venice, working as a teacher - quite a change from some of the other things he's done but I'm certain he'll do well at whatever he puts his mind to. For some time, Sean lived in Venice, and even worked in gondola building at Squero Canaletto. I went to Venice for the weekend to catch up with old friends and just have a nice weekend. Between Campo Santa Maria Formosa and San Giovanni e Paolo, I came across a book shop. 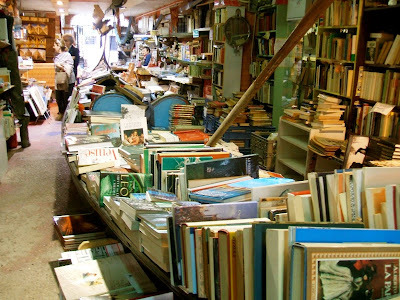 I never saw this place before... which I find odd because firstly I know Venice like the inside of my pockets as you say in Italian, and secondly because there is a kayak out front covered in books. Kinda hard to miss. It's obvious it used to be a squero and the owner has taken steps to make sure it's painfully obvious it was used for boats. The water entrance is open but blocked with paddles,showing you that you are right by the canal, and nautical things are hanging everywhere yet covered in books. The main attraction...a gondola covered in books about Venice. I took some fun pics of it. It might take a second to understand what you're seeing. It's fun. It didn't occur to me at the time since I was just walking around with Louisa enjoying the day...but I should have asked what the story was about the place. I don't know if it's been there a while and I was just at work during the day so I never saw it when I lived in Venice, or what. I've seen gondolas used for everything from planter boxes, to bed frames, to salad bars, but this is the first time I've seen one used as a book case. Thanks for the photos and info Sean. Hey! I think I see a copy of Donatelli's book "The Gondola" there on the poppa. 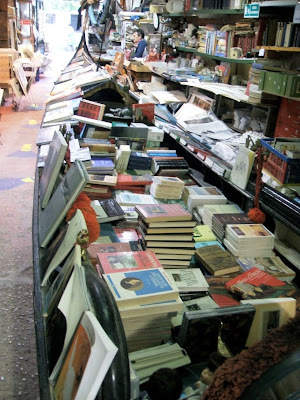 I know this bookshop :-) I have passed it many times on the canal, and usually show my guests the water side entrance where they have a large old bath tub standing, full of books. I have never seen it from the other side, though. and the bookshop is around the corner to the right, where the gondola is going. Rene, do you know anything about what squero was in that building before it became a bookshop? We would love to find out. I'm not so sure the place can have been a squero. The entrance I have seen on the canal was little more than a doorway like so many others. I think the doorway is too narrow for launching gondolas. Also, the canal is not very wide, only 4-5 meters. It would have been really hard to launch a gondola from the entrance I have seen. There is a canal on the other side, but it is not much wider. I am not an expert on gondolas, but they are normally 11-12m in length, so I assume you will need a bit of space to launch them, at least 7-8m in front of the ramp. I have seen the space available at Tramontin, Trovaso and the one in Rio dei Muti, and they have a lot more room in front of them than is available here. I won't be in Venice until April, so I have no way of finding out anything before then. Here's the only photo I have of the bookshop seen from the canal.